Call owner Blair at 617-901-2166. 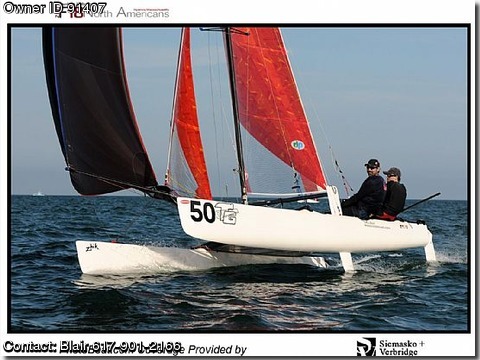 2002 Hobie Tiger F18 catamaran for sale. This boat is in excellent condition with tons of race upgrades and mods. Its very well set up and easy to sail quickly. The boat has all new standing and running rigging this year, every single line has been changed. It has a tapered spin halyard and tapered FSR Robline mainsheet, brand new style Tiger rudders, shock cord take ups for the tack line, downhaul and jib sheet. She comes with two spins, one Hobie (practice, fun sail) and one Performance Sail spin (race ready, a few small repaired nicks, but still great shape and fast!!) SNU snuffer, 2010 STX smoke jib and a white ST main both in excellent race ready shape. Staymaster shroud adjusters for easy rig tensioning. I also have brand new orange Glaser/DP custom F18 main and jib ($2600 extra) that are smoking hot! They are super fast and amazingly good looking! The port daggerboard has an upf@#?er for those top mark roundings, both boards have small tip repairs, but are in very good shape. New access ports, very well sealed, the boat barely takes on a drop of water after wet, lumpy sailing. Shes a quick ride, just got the speed record on the last day of the F18 NAs (15.1 kts in 10 kts breeze!). Custom trailerable cover plus beach wheels included, excellent aluminum Trailex trailer with tool box and sail box available for $1500 extra. The boat has been washed, waxed and wet sanded regularly and always kept covered. She is the cleanest 2002 Tiger you will find. Much love was put into this boat, it really needs nothing, just a great home! This is a great boat for getting into F18 racing or just going out and having a blast on the water! $8000 or BO for boat, cover, white main and smoke jib. $2500 extra to throw in the brand new F18 Glaser orange main and jib ($3300 cost!) I can arrange for delivery or meet halfway in New England, boat is in RI. I will rig it up for you and take out a serious buyer for a sail, with a cash deposit in hand.